Have You Got Your Echelon 2012 Tickets Yet? 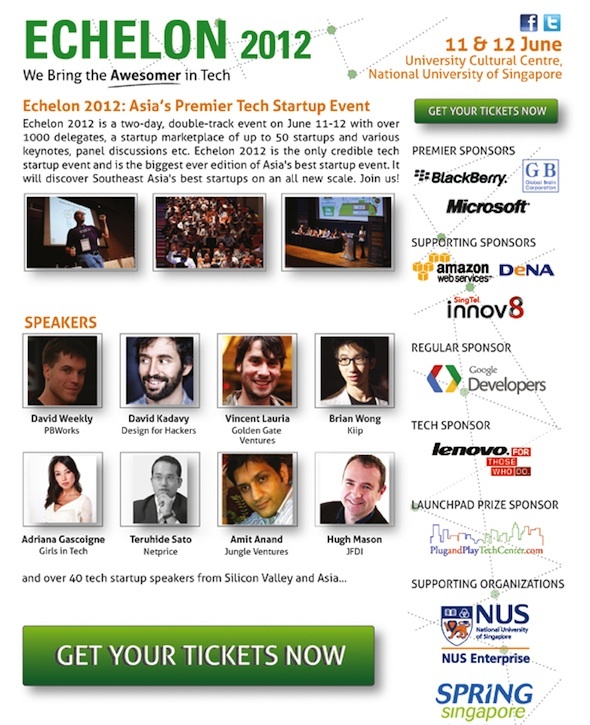 Just under a month left until Echelon 2012: Asia’s premier tech startup event kicks off on the 11th & 12th June at the University Cultural Centre at the National University Of Singapore. This 2 day, double track event is expecting over 1000 delegates, will feature a startup marketplace of up to 50 startups and various keynotes and panel discussions too. A few of the speakers that will be in attendance are: David Weekly from PBWorks, David Kadavy from Design for Hackers, Adriana Gascoigne from Girls In Tech as well as Amit Anand from Jungle Ventures. The topics that are going to be covered over the 2 days event will be things like Tech Investment Around the Region, Startup Growth and Scaling, From Startup To IPO and the X-Factor in Tech. So if you’re looking to take the plunge into the world of Startups or already have one in the works, Echelon is certainly the place for you! Lowyat.NET is one of the Media Partners for Echelon 2012. Win Electronic Lifestyle Magazine (电子时尚) launch party VIP passes!